Here is my February dress, hurray x 100 = me. 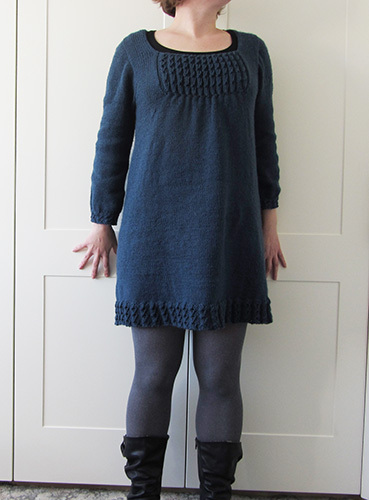 February is long gone but it took me a while to finish up this dress, especially the skirt which took forever to knit. Even more: I have been a bit silent this past week because I was knitting my head off. But it was worthy: I am plain in love with this dress. It is blue (and what blue! ), it is soft, it is warm and it is stylish. This is the Caviar Dress pattern by Yoko Johnston. As far as patterns are concerned, this one is a gem. 1) The project involves lots of little cool and tricky techniques which make the dress real fun to knit. It is worked from top to bottom and is absolutely seamless (I hate seams). The tricky bit are the make one right and make one left at the top of the dress: sometimes it is not easy to see the stitches too well when there is not much fabric yet. The caviar pattern is exquisite and extra simple to make. 2) The pattern is so well written I used to read it in bed before going to sleep to find out what I would be doing next. Every step is very clear, there are stitch count check points and unusual stitches are explained. There is no room for a mistake in this pattern. I would not recommend it to a beginner knitter though because there is a lot going on. But if you are confortable with knitting in the round and have enough patience for the skirt bit or are not in a hurry, I highly recommend to go for this pattern. Hum, what colour should I do next? Next month (March) is now. Holy Molly, I’d better get my March dress sorted. Ha thank you. This design is really amazing, I agree. Thanks Claire! I have to say I won’t start such a big knitting project any time soon, but it was definitely worth the time.